It’s a common belief that all the baby teeth must fall out before getting checked by an orthodontist. However, it’s actually best to have children examined earlier rather than later. In fact, the American Association of Orthodontists recommends that the initial orthodontic evaluation should occur no later than age seven. When you have your child evaluated at this young age, we are able to advise you about any orthodontic issues that might be on the horizon. In some cases, we will recommend early, interceptive treatment. With early treatment, we have the ability to take the least invasive approach to everything from making room for adult teeth to advancing and/or expanding your child’s jaw. Addressing these issues while their bones are growing gives us the ability to address things that, left unchecked, could require surgery and/or extraction of permanent teeth. Most children don’t need early treatment and that’s why we’ve created our Growth & Guidance program. Children in this program don’t quite need treatment, but we’re monitoring their growth until they’re ready. Their growth and guidance appointments will be scheduled every 6 to 12 months at no cost to you. Plus, they will learn great habits that will help them maintain a healthy, beautiful smile throughout their lives. Class II problems represent abnormal bite relationships in which the upper jaw and teeth project ahead of the lower jaw, called “overjet.” Class II patients usually exhibit a convex facial profile with a deficient chin prominence. 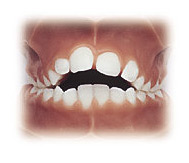 Typically, a Class II problem is inherited and results in a shorter than normal lower jaw. Other factors, such as persistent thumb sucking, can aggravate these problems. Correction of this disorder generally requires influencing facial growth to bring the upper and lower jaws and teeth into their proper position. Class III problems are also primarily genetic in origin. In this instance, the lower jaw and teeth are displaced to the front of the upper jaw structures. Facially, the appearance may give the impression that the lower jaw is excessively large, but in many cases the lack of upper jaw development is at fault. A normal bite is a healthy smile. Posterior crossbites usually result from a constricted upper jaw or unusually wide lower jaw. A narrow upper jaw will often force a patient to move her lower jaw forward or to the side when closing into a stable bite. When closed into this accommodated position, the lower teeth are located outside the upper teeth. This posturing may result in an incorrect functional position of the lower jaw with accompanying facial asymmetry. Spaces between teeth are another common problem associated with the need for orthodontic care. Like crowding, spacing may be related to a tooth-to-jaw size disharmony. Gum tissue attachments called “frenae” are also a common cause of spacing between the front teeth. Excessive vertical overlap of the front teeth as well as incisor protrusion may lead to spacing. Other contributing factors include atypical or unusually narrow teeth, and missing or impacted teeth. Excessive vertical overlap of incisor teeth, called “overbite,” is generally found in association with a discrepancy between the length of the upper and lower jaws. It usually results in excessive eruption of either the upper or lower incisors or both. Associated problems include: excessive display of gum tissue, lip protrusion or entrapment, biting the roof of the mouth, and incisor wear. A lack of vertical overlap of the incisor teeth can usually be traced to jaw disharmony or persistent habits (that is, digit sucking habits and posturing of the tongue between the front teeth) or excessive vertical growth of one or both jaws. Early assessment and intervention with these disorders is critical to the overall success. Crowding is the lack of space for all the teeth to fit normally within the jaws. The teeth may be twisted or displaced. Crowding occurs when there is disharmony in the tooth to jaw size relationship or when the teeth are larger than the available space. Crowding can be caused by improper eruption of teeth (sequence and / or location) and early or late loss of primary teeth.